Marcio is a landscape photographer based in Brasilia, Brazil. 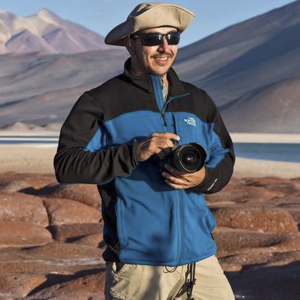 During his career, he has earned a well-deserved reputation for his prize-winning work, which has been published in a variety of travel and tourism magazines, as well as in books and guides featuring the sites of Brazil. He also creates unique panoramas and was the first Brazilian to produce an underwater spherical panorama. It holds the current guinness world record for the largest underwater image. Today, Marcio is devoted to produce images for fine art prints and spherical panoramas. He also make workshops and photographic expeditions within Brazil and in neighboring countries. His images have been awarded and had Honorable Mentions in important competitions like Claus Panoramic Photocontest, Sony WPA, WPY, MML, NBP, Oasis, PX3, Big Picture, Memorial Felix, Nature Talks, Glanzlichter, Asferico, Montphoto, IGPOTY, OPOTY, Panoawards, MIFA, and Loupe Awards. House under the milky wayArgentina Patagonia. Dead tree on river bank, Argentina Patagonia.